Puppeteer Master is indeed very complete, but thanks to that the mod became very very hard to use. To find the animation you want is not practical at all. 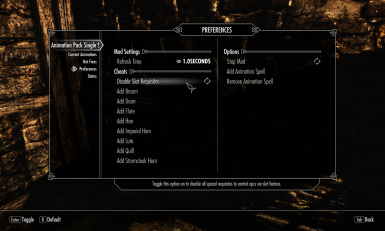 For an immersive use, your mod is far better. Its objective and simple, and thats exactly what is needed. And, one of the worst things, Puppeteer Master doesn't work with hotkey. You can even bind it, but it doesn't activate when prompted. 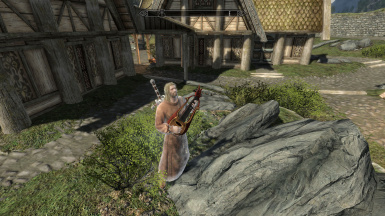 Also, can't add songs to play when activate the animation with instruments. In quantity Puppeteer has a lot, but for a normal usage, most of those will be wasted. If you want negative points about Puppeteer, I got plenty. 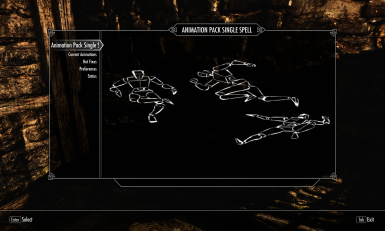 Thumbs up for Animation Pack Single Spell Keep it up, you are doing a great job! Honestly, the amount of time you take to find the option you want is far too annoying for me. Love your mod, honestly Best animation pack ever. Simple and has everything an immersive gameplay might need. Would endorse you twice if I could! where do I get this single spell to activate these animations ? When I chose to play an cough animation, after I ended it and started to use the new animation "drink" it worked for 3 secs but after it the cough animation started to play again without any reasons. Now I can't play any other animations thanks to the cough animation bug. The MCM is behaving weirdly with me. I change values but as soon as I leave, the menu resets the values to default. The MCM menu is showing with "$APSS" in the title and "$APSS" in all options. Yey JvM !! You return to mod ! Great !! 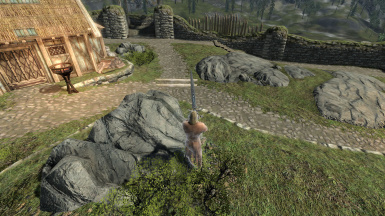 I'm using a makro key to activate the "enableplayercontrols" to see Frostfall bars. If you fix this I will be very happy! But for the information you let in the mod page this next update will be far better and amazing ! I'm looking forward for this update! And for people that doesn't know this mod ! Have control of your animations is incredible immersive ! 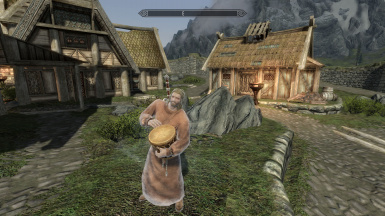 And turn the Skyrim experience a lot more fun ! You should test this mod! In the new Frostfall with a hotkey we can show bars that let we know when we are warm. 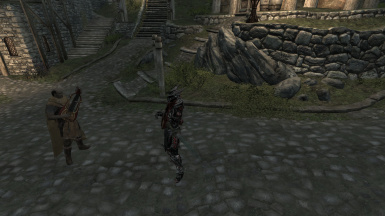 If you could do a way that the animations play with the frostfall bars showing. If is not possible, it's just fine, because this mod is a masterpiece of immersion for me and my wife Shin. Thx a lot for this mod ! Best wishes for you ! I will have to see that, cuz I download the update of frostfall but never install it. if it works, a quick patch can be done easily. I open the console during animation and type "enableplayercontrols" and it work! That is exactly what I'm talk about. If you can do the patch will be tremendous amazing and solve the problem. This is a great little mod that needs a lot more attention. I tried PM but was far to immersion breaking and complicated. I wanted a very unobtrusive way to handle some simple poses and animations. I had been using the console whenever I wanted to do a few poses but this is better as it has a lot more variety and the console ones are limited. For me entering console more or casting a "do something" spell are about the same. Since you made it a power versus a casting - I just consider it my character saying he will do something ... like "I am going to eat my meal." So glad I stumbled across this little gem. 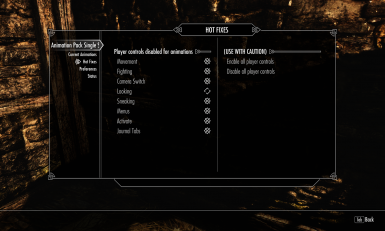 I don't know if you still visit this mod or not but sometimes simpler is better - this is just perfect for a role playing who wants just a simple little addition to the game. Thanks for sharing. I found quite an interesting bug. 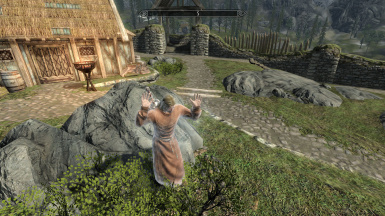 I went to Riften and tried out the option "Hug to" on Haelga. She died instantly after the animation ended and I got a 1000 gp bounty on my head. I am not sure is this only happening to me, maybe someone can check it out? 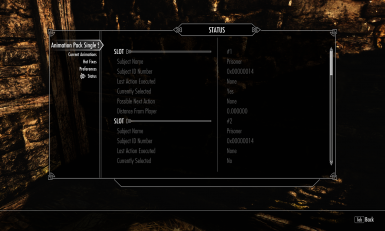 Hi could someone please explain the aspects of the Beta or Classic mod? Actually nothing in terms of animations, the big diff is that classic will use a hidden quest to add and maintain your "Do something" spell, while in beta's version there will be no quest and the only way to add the spell is by reading the book, the maintain is done by a hidden active spell that wear off after unequipping the main spell . Version 2.0 show sit animation problem, when I point to a sit bench for example the menu alert: "not sit" message and I can't perform any of the siting animations. "-No more sit interval or sit instructions, quest modded with update event every 2 seconds if spell equipped." Equip spell, do whatever you want (use the spell or not it doesn't matter), find a chair or bench (any) and just sit like you normally sit. After sitting try cast the spell (it should work, even while sitting) go to =SIT= and done. PD: If updating from older version, since quest was modified, you may need (not 100% sure) to disable the plugin, enter game save without it, exit game, re-enable the plugin, enter game and load the saved game. The clean save solve the problem! The spell show nice and work like a charm ! JvM you are the best ! The mod become even more better. I Think that is it, the end master piece. 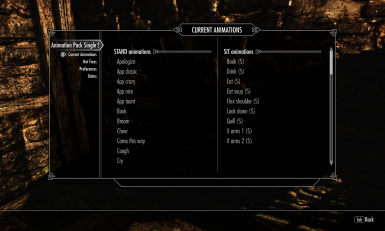 The best animation mod in Nexus ! Sorry for the people that don´t even try this mod.